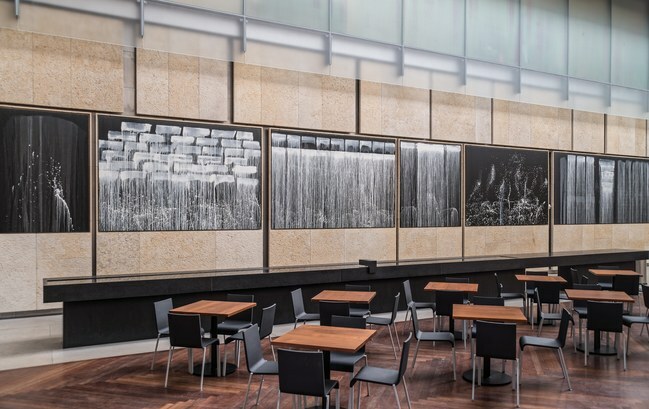 In 1933, the first time that the Barnes Foundation asked an artist to paint something to fit specifically into its walls, the artist was Henri Matisse. Matisse, who had to be convinced, rented a warehouse in Nice to work on what became “The Dance,” only to discover, after a first try, that he’d gotten the measurements wrong. (In 1990, the early version of the triptych mural was discovered and ended up at the Musée d’Art Moderne, in Paris.) Not surprisingly, the second painter to be commissioned by the Barnes, Pat Steir, asked the Barnes to send their own measurements. Then she doubled-checked them herself. Unlike Matisse, Steir grew up going to the Barnes, not to mention the Philadelphia Art Museum, a view of which happens to be visible from the Barnes’s Annenberg Court, the gallery that now displays the works that she made: eleven seven-foot-tall, black-and-white oil-on-canvas drip paintings.